UPDATED: Thu., Dec. 6, 2018, 11:13 p.m.
A 24-year-old man allegedly shot and killed his grandfather Wednesday night north of Chattaroy, before taking a wallet, jewelry and credit cards from his grandparents and fleeing in the victim’s truck. Within two hours, Spokane police spotted the truck and the suspect was stopped and arrested. The suspect, Trystn G. Higgins, faces a domestic murder charge for killing Gerald Higgins. Trystn Higgins appeared Thursday in Spokane County District Court, where a defense attorney told the judge his client had serious mental health issues and requested he receive treatment. “This is completely out of his nature,” said Higgins’ lawyer, Robert Sargent. 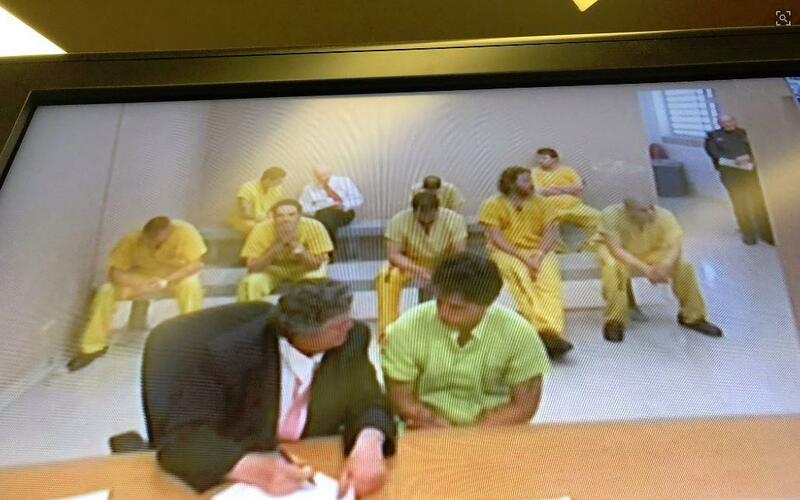 As Higgins sat with his head buried in his hands Thursday, Judge Jeffrey Smith set his bond at $500,000. Around 7 p.m. Wednesday, Higgins’ grandmother found her husband in a pool of blood in their garage after she got home, at 27724 N. Bear Lake Road, according to court documents. A carpet had been placed over him and there were drag marks from blood trailing out the door. The woman called 911, reporting that she had found a gun on a bed and her credit cards were missing, court documents state. When deputies arrived, Gerald Higgins was pronounced dead, and his wife told them she believed her grandson had killed him. Trystn Higgins had been living with his grandparents for about a month and a half. Before that, he was being treated involuntarily for mental health issues, his attorney said. When detectives with the major crimes unit arrived and discovered Gerald Higgins’ truck was missing from the scene, they reported the vehicle as stolen and quickly identified the 24-year-old Higgins as a person of interest. The information was broadcast to all regional law enforcement agencies. At approximately 8:45 p.m., a Spokane police officer saw the stolen vehicle and alerted additional officers, according to court documents. The vehicle was stopped near East Sprague Avenue and South Cowley Street in downtown Spokane, and the suspect was taken into custody without incident. He told a detective that while his grandparents were at work, he searched the garage and shop and found a shotgun, according to court documents. Trystn Higgins later texted his grandmother, who told him that his grandfather would be home about 5 or 6 p.m. When his grandfather got home, Trystn Higgins “greeted him outside and then went into the home and retrieved the shotgun” and then shot Gerald, court documents stated. Dave Ross lives across the street from the house and knew the couple who lived there for 20 years, he said. Ross didn’t hear any gunshots but saw flashing lights from patrol cars and police putting up caution tape at about 7:30 p.m.
Staff writer Nicholas Deshais contributed to this report. Published: Dec. 6, 2018, 8:22 a.m. Updated: Dec. 6, 2018, 11:13 p.m.